The closer we get to closing on the sale of our house — I’m beginning to miss my garden. Luckily, I’m getting a chance to enjoy the bloom of so many of our trees and shrubs “one-more-time” before we move. Some of my absolute favorite things in our garden are the pink Dogwood trees that line our property. When I moved to East Brunswick 15 years ago, I met a landscaper named Jeff Kumka of 4 Season’s Landscaping. Jeff is retired now, but he did an incredible job landscaping our home, in a way that I could enjoy all 4 seasons. Just.as.his.companys.name.promises. <3 Jeff, I hope you are enjoying your retirement. 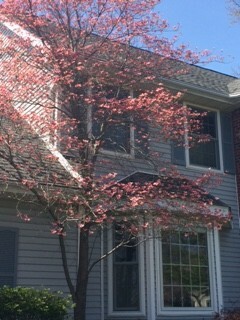 As I gaze out my front window and our master bedroom windows….the pink clouds that are the canopy of the dogwoods in bloom this week just lighten my soul. I will think of you whenever i see Dogwoods in bloom. Thank you for the joy of my garden these past 15 years.